Alcazar is Seville's top attraction and one of the most famous attractions in Spain. The palace complex is a UNESCO World Heritage Site and an undisputed architectural masterpiece by any standards. 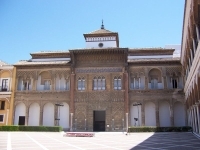 The site of Seville's Moorish Alcazar palace has been occupied by the city's rulers since Roman times, and has been a favoured residence of Spanish kings since the Middle Ages. The palace was established by the Moors as early as the 7th century, although it was primarily built in the 1300s, and has been added to and altered by successive occupants ever since. First to enlarge the building was the infamous al-Mu'tadid of the Abbadids, who reputedly kept a harem of 800 women and decorated the terraces with flowers planted in the skulls of his decapitated enemies. Of the early Christian additions most notable is the colonnaded quadrangle of the Patio of the Maids. The golden-domed Salon de los Embajadores was a wing built by Fernando and Isabel, and was where the royal pair welcomed Columbus back after his discovery of America. The palace is set in beautiful, extensive gardens where it is possible to picnic if you bring your own food. Otherwise, there is a small restaurant overlooking the gardens. Visitors should allow several hours to explore this spectacular palace complex. Transport: The Alcazar is best reached by foot from the city centre. Opening times: Open daily 9.30am to 5pm (October to March) and 9.30am to 7pm (April to September).